This year, National Hamburger Day lands on May 28th — and what better way to celebrate a staple of traditional American cuisine than with Rare Bar & Grill (Fashion 26 Hotel, 152 W. 26 St. 212.807.7273), and one of their delicious burgers! The restaurant is offering burger lovers the choice of the “Original Louis’ Lunch” burger or their Signature Cheese burger, a side of fries and a beer for only $20.10. The restaurant will also offer their regular menu. Happy to offer burger lovers a taste of history, Rare is the only area restaurant currently offering the Louis Lunch burger. 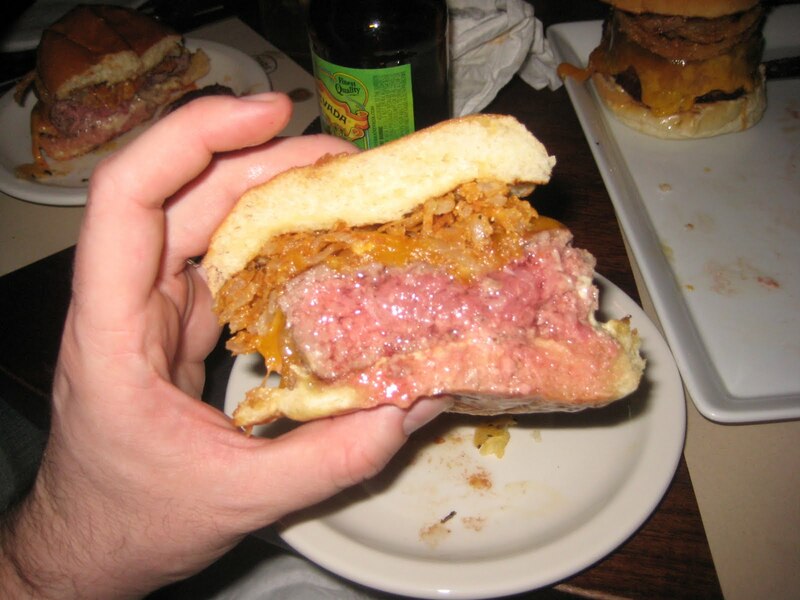 The burger that started it all contains six ounces of secret house blend beef patty, topped with a grilled onion and served on white toast with a shmear of sharp cheddar. Don’t even think of asking for ketchup – that’s NOT how Louis intended it to be eaten! Join BURGER CONQUEST as we celebrate this most glorious of holidays. There will be one seating at 8 p.m. EST on Friday, May 28th. Anyone who loves burgers is welcome and will have their picture taken for the website. You must RSVP by Wednesday, May 26th at 4 p.m. EST. 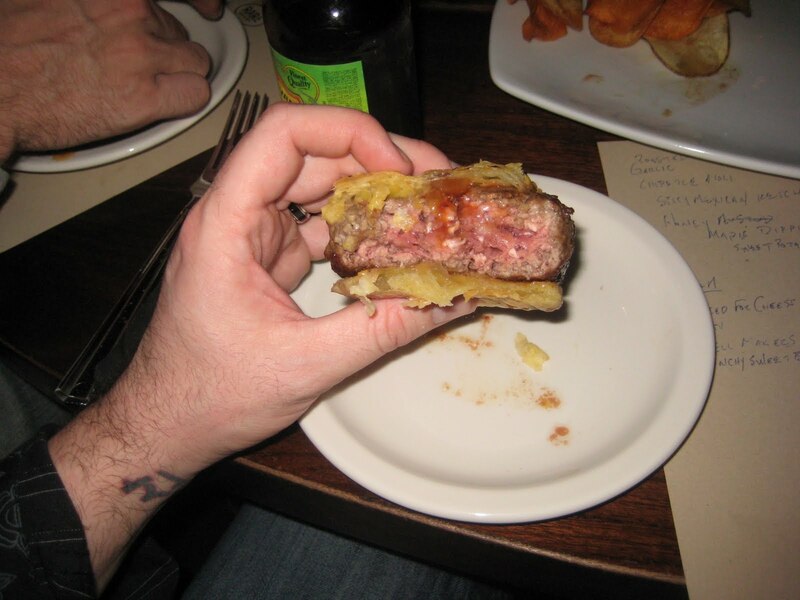 Each party may submit 1 photo and a 1-paragraph review/story about the evening for a guest blog on Burger Conquest. Photos and reviews will also be posted on the Burger Conquest Faceboook page. Please make sure to have your photo and text submitted no later than Monday, My 31st at 1 pm EST. SEE YOU ON MAY 28TH AT 8 PM! 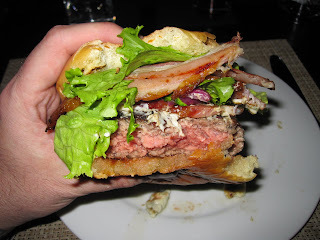 Click here for the official Burger Conquest review of Rare Bar and Grill. Click here to download a reminder to your Outlook or iCal. 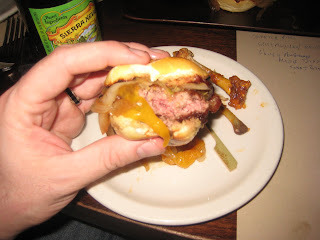 This entry was posted in Bar, Burgers, Event, Gourmet Burgers, Hamburgers, National Hamburger Month, New York and tagged best burger, burger conquest, cheese, chelsea, ciancio, david, Event, french fries, hamburger, louis lunch, May 28th, National Hamburger Day, nyc, party, rare bar and grill, restaurant, rev, review, rsvp. Bookmark the permalink.